Having recently announced a partnership with Tata communications to serve cloud-based mobile and IoT services across Latin America, Antel also performed best for average download and upload speeds on 4G, as well as demonstrating good network stability in our latest Mobile Experience report for Uruguay. Across Uruguay, Antel recorded the fastest average 4G download speeds between December and February, of 11.89 Mbps, inches ahead of second place Movistar which averaged 11.79 Mbps. Claro recorded only around half these speeds on 4G, averaging 6.95 Mbps, but did perform best for 3G speeds across the country with a result of 4.08 Mbps, ahead of both Movistar and Antel respectively. On 4G, Antel managed to widen the gap with Movistar in Montevideo, recording average speeds of 14.60 Mbps, yet dropped to second place in Maldonado where Movistar took the 4G lead as they averaged download speeds of 13.26 Mbps compared with 11.22 Mbps for Antel. With a delay of 32.1 ms and 64.7 ms, Movistar performed best for the lowest average latency on 4G and 3G respectively. Antel placed second across the country, averaging 38.7 ms on 4G and 78.5 ms on 3G, as Claro placed third with an average result between December and February of 45.7 ms and 90.8 ms on 4G and 3G. The only regional differences for latency in our Mobile Experience Report for Uruguay was in Maldonado, where Antel’s average latency fell to 46.1 ms, putting them just behind Claro in third place. On 4G, Movistar demonstrated the lowest average jitter results for the last three months, as well as relatively low average packet loss. Similarly, Antel recorded the lowest packet loss and relatively low average jitter, putting both operators in a good position for overall network stability. 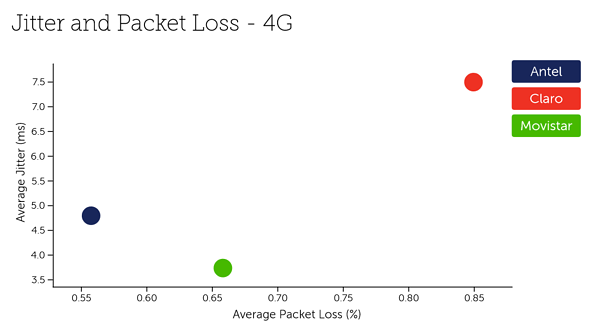 Claro demonstrated the highest level of both jitter and packet loss across the country, but performed better in Maldonado where its average jitter dropped to approximately 4.4 ms.
Our findings for Uruguay are based on 3.91 billion network quality measurements including 658,000 speed tests between December 2018 and February 2019. Our latest complimentary Mobile Experience Report is available to download from the Tutela Insights portal.